The Scottish Highland is a very old breed originating in Scotland. Unlike cattle selected to grow fast on grain, these animals were bred to thrive as grazers on natural pastures. They are renowned for their thick hairy coats that enables them to stay warm and dry even in cold and wet weather. Most cattle develop a thick layer of subcutaneous fat to stay warm but these animals store their fat as "marbling" throughout the meat. This gives the beef a distinctive eating quality - lean, yet exceptionally juicy, flavorful, and tender. Raising Angus cattle is a family tradition. Eric's great uncle, James Bowman, established his herd of Black Aberdeen Angus in Guelph in 1891. He was inducted into the Canadian Ontario Agricultural Hall of Fame for his contribution to agriculture. Our first Red Angus cattle were purchased from Roland Bowman another great nephew. The Murray Greys are a cross between a Shorthorn and Angus. They do not have the same long history as the rest as this breed was recognized in 1962. These animals are polled and range in colour from light silver to chocolate and occasionally black. They have been exported for their high quality meat production and cut ability.
" 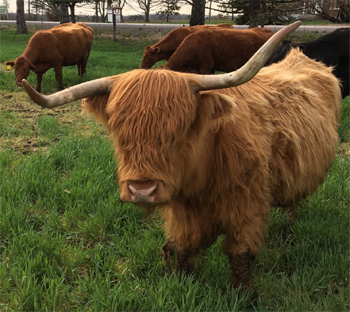 To maintain a healthy environment for the current farm inhabitants - cattle, soil and people - and leave an environmentally sound legacy for our successors"
The words " everything old is new again" brings us back to the Bowmanview roots. There have been several eras of transition on the farm. T. R Bowman commenced organic, J.W. initiated the use of chemicals, E.W continued the trend but has reverted back to organics and the foreseeable future will have A.M. farming under the organic umbrella. This excerpt from Joni Mitchell's song "Big Yellow Taxi" makes an environmental statement about the farming community as we know it. One of our concerns is the increase in the use of herbicides, synthetic fertilizers, hormone growth implants in animals and feeding cattle with grain-based diets containing antibiotics. The other topic of concern that is discussed around our family table is the fact that many of the small family farms are disappearing and being replaced by so called "agri-businesses" which are factory type operations. These trends are supported by the companies who manufacture the products and who in turn benefit financially. Organic agriculture will help to leave the next generation a path of ecological foot prints to follow, restore the natural fertility of the soil and improve water quality to make their walk a safer one. .